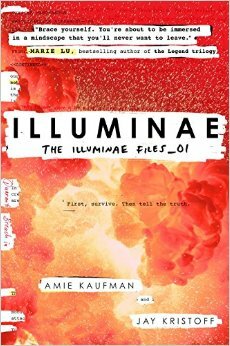 Set in the year 2575, “Illuminae” follows Kady and Ezra on an epic, suspenseful and terrifying journey. The two are barely speaking to each other after their recent breakup when their planet is caught in the middle of a violent fight between two megacorporations that destroy nearly everything and everyone around them. Escaping from their planet becomes the least of their worries as a horrific disease sweeps through the evacuating ships, leaving terror in its wake. On top of that, one of their ship’s main computers, AIDEN, is malfunctioning in a bizarre and unprecedented way, leaving them not only helpless against the pursuit of a corporation’s fleet but also at the mercy of a rogue computer. Despite Kady’s anger with Ezra, it soon becomes clear that it’s up to them to find the truth the captain is withholding from them if they're going to escape with their lives. YOU GUYS! When I first started this one, I wasn’t sure about it. The entire book is written as a dossier of documents. You’re reading in email and IM format, as well as medical records, camera recordings, and art pages. It felt a little overwhelming and I wasn’t sure I was doing it right. haha. Once you get the hang of it, it’s an epic, creepy/scary, crazy awesome page turner. There are many pages where the story is told via art pages. The words are written to form pictures that help you understand what’s happening without reading a word. They were not only cinematic, but pulled a lot of emotion out of me, which was surprising. There were different levels of “wow” for me in this read, and the twist was one of them. That one will side swipe you. This one will take you through all the feels. Sad, angry, livid, horrified, creeped out, grossed out, happy, blissful… This one’s got a great set of characters and an intense storyline that I fell in love with. If you’re a fan of the Starbound trilogy, this will feel a bit reminiscent since Amie Kaufman co-authored it. But I think Kristoff’s influence was just the thing to make it darker and separate. Totally unique, thrilling, and cinematic reading experience.